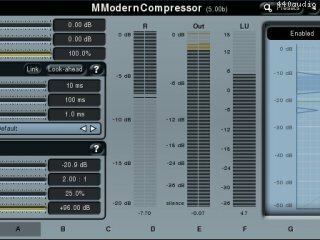 MModernCompressor is a powerful compressor plugin based on our MDynamics engine. It is designed simply for ease of use and optimized to get pristine quality results as quickly as possible without having to master the more advanced features in MDynamics. It also contains a powerful metering system providing everything from gain reduction to a level distribution analyzer. -Powerful metering system: MModernCompressor displays output peak level, gain reduction, ITU-R BS.1770-1 and EBU 3341 compliant loudness, and also a loudness distribution graph, which you can use to analyze dynamic properties of your audio and even let the compressor set the basic compressor parameters automatically. - Up to 8 channels surround processing: our plugins can handle not only mono and stereo signals, but also up to 8 channels of surround audio, making them ideal for audio production for movies, games etc. - Adjustable up-sampling 1x-16x to minimize aliasing and get an even clearer sound. - Extremely advanced and easy-to-use user interface - our products are always designed to enhance the workflow. You can easily change all values, fine-tune each control in multiple ways. Easy orientation in a standardized GUI, textual editing and smooth visualization with almost unlimited zooming are standard in all of our plugins. Moreover our plugins are the world first (and still the only ones), which support resizable and stylable GUI's. - MIDI controllers with MIDI learn - you can map any parameter to any MIDI controller or MIDI keyboard and control it realtime or record and automate it. - Very fast, optimized for SSE and SSE2 processors. - Global preset management and online preset exchange - using a title button you can save your settings (which are shared on the computer) so you can easily access these in other songs. Moreover all plugins can automatically share your presets and download presets of other users from our servers (if this feature is enabled). We are building a community and you can be a part of it! Smart randomization algorithm - new smart randomization engine randomizes everything reasonable parameter in the plugin, including modulators, and chooses settings wisely for much better results. On easy screen only multiparameters are randomized. Added AGC (automatic gain control) which ensures the output sounds as loud as the input making preset browsing and randomization much easier. Added lots of presets for most creative plugins. Oscillators can now load custom samples (WAV, MP3, FLAC) and mix them with other sources (oscillator, envelope, step sequencer). Ctrl+click on a "Presets" button loads a random preset. Added global modulator switch, presets and randomizer. Added band presets and band randomizer for multiband plugins. Added signal generator shape menu images, presets and randomizer. Added denoiser active preset for MSpectralDynamics. Added active presets for MDynamicEq and MAutoDynamicEq. MBandPass: All filters except 6dB/oct are now resonant, added gain & dry/wet. MLoudnessAnalyzer: Added true-peak meter, offset parameter. Added Hold parameter for the modulator follower mode. All momentary & short-term loudness meters now have maximum value indicator. Delay mode is now "classic" by default. "Auto-tune" panel in MAutoPitch renamed due to copyright law violations. Fix: MLoudnessAnalyzer's loudness range meter didn't use correct ballistics. Fix: Harmonizer in granular mode crashes when upsampling and high grain size. Fix: MLoudnessAnalyzer wasn't resizing when multiple channels have been set. Fix: A few compatibility issues, upgraded to VST 3.51. Fix: Analyzers didn't work correctly in left + right mode. Huge memory and GUI optimizations, new knob based interfaces. Each oscillator can now also be controlled using harmonics instead of shape. Added "double" envelope shape type. Analyzer & sonogram can now optionally be enabled even when the GUI is hidden. A-H presets now send automation when changed. MIDI note controllers now react on pitch-bend immediately. Added feedback phase invert and saturation for phasers. Added second tape mode for flangers. Added knob mode for most plugins, which turns their slider based GUI into knob based one. MSpectralDynamics can now capture the threshold curve based on the input signal. MDynamics and MMultiBandDynamics weren't showing correct shapes for upwards expander. Added IR phase invert and left/right delays for MMultiBandConvolution. Fix: Drag & drop wave file for analysis didn't work in MAutoEqualizer. Fix: MAutoEqualizer could crash under specific circumstances when automating gain. Text editor. MNotepad is a simple text editor, which won't perform any audio processing, but you can use it to store comments, lyrics or just any text. Crossfade utility. MRatio is a single utility that lets you crossfade between the main input and sidechain. Its 2 modulators however open up a whole set of creative possibilities. Distortion. MWaveFolder is an analog inspired distortion module with a unique character ranging from mild harmonic enhancement to a complete sound destruction.